This tiny lane, with the buildings hanging into it, leads to Buttermarket and the Cathedral gate. The building on the left was once a Pilgrim Inn known as the `Cheker of the Hope' established in 1392 to replace the older `hospitals' where Pilgrims would stay before visiting the Shrine of St. Thomas in the Cathedral. This was an immense establishment occupying a large part of the centre of the city. The stone arches here are the remnants of its frontage. 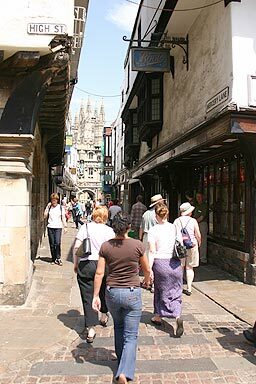 Turning right here takes you into the Parade, part of Canterbury's main street. Turning left takes you into the High Street, it's the same road as the Parade but the name changes.